Jessica Tilton wanted to see lava flowing into the ocean off Hawaii’s Big Island but thought her sightseeing boat got too close to the explosive phenomenon. 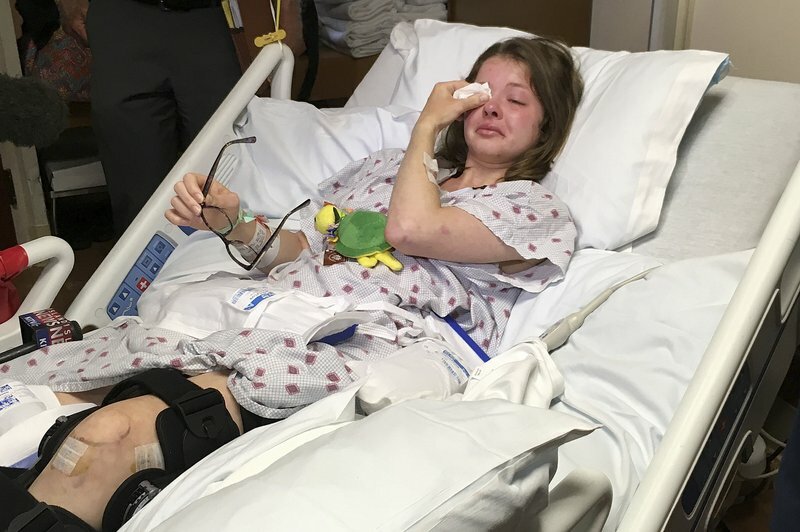 “It was too close for comfort,” the 20-year-old from Washington, Illinois, told reporters Tuesday from her Honolulu hospital bed. She could not estimate how close the boat was but said she expected it would be farther away. [post_ads]Tilton was on a July 16 tour with her twin 15-year-old sisters and father when an explosion caused by the lava sent molten rock crashing through the roof of the boat, injuring 23 people — her the most seriously. The others had minor burns and scrapes. A boulder of lava about 2 feet (0.6 meters) in diameter hit her, breaking her thigh bone and pelvis and leaving her with other injuries. She was airlifted to Honolulu, where she underwent several surgeries and is working on rehabilitation that focuses on trying to sit up and get into a wheelchair. Other surgeries were expected, and it was not clear when she will be able to leave the hospital. Tilton and her family went on the lava tour on the second-to-the-last day of their Hawaii vacation celebrating her parents’ 25th wedding anniversary. Her mother, who gets seasick, stayed on land. Sitting near a railing, Tilton turned to cover one of her sisters when the glowing rock hit. Two surgeons who were on the boat came to her aid, along with an emergency medical technician who also was injured, Tilton said. It took more than an hour to get back to shore on rough seas — “the longest hour of my life,” she said. Tilton has to take a leave of absence from the fall semester of her junior year at Bradley University in Illinois. As a contemporary and lyrical jazz dancer, she is hoping she can heal and return to a normal life. Her parents, Rob and Teresa Tilton, have stayed in Honolulu while their oldest daughter is hospitalized. Shane Turpin, owner and captain of the vessel, has said he never saw the explosion that rained molten rock down on top of his boat. He and his tour group had been in the area for about 20 minutes making passes of lava from an erupting volcano as it entered the ocean about 500 yards offshore, Turpin said. He didn’t observe “any major explosions,” so he navigated his vessel closer, to about 250 yards (229 meters) from the lava. Officials have warned of the danger of getting close to molten rock oozing into the sea, saying the interaction can create clouds of acid and fine glass. And whenever hot lava enters much cooler ocean waters, there is the potential for large explosions. Despite the hazards, several companies operate such tours. The Coast Guard prohibits vessels from getting closer than 984 feet (300 meters) from lava entering the ocean. The agency had been allowing experienced boat operators to apply for a special license to get closer, up to 164 feet (50 meters), but it stopped allowing those exceptions.